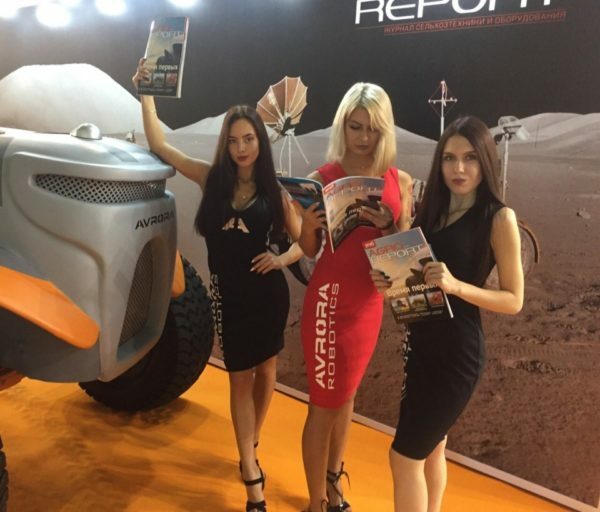 From 9 to 12 October, Aurora Robotics took part in the Agrosalon 2018 agricultural equipment exhibition in Moscow, presenting the prototype of the Agrobot unmanned tractor together with Agroreport magazine, the general partner of the AGROSALON innovation competition. Over 500,000 square meters of over 70,000 square meters. domestic and foreign manufacturers from 28 countries of the world presented over 700 samples of innovative agricultural machinery and equipment for work in the field. Specialized exposition included the whole range of equipment for work on the land — tractors, combines, forage and tillage equipment, sowing and loading machines, equipment for applying fertilizers, plant protection, etc. On the basis of the exhibition, many seminars and master classes were held with the participation of leading foreign and Russian experts, where topical issues in the field of agriculture were highlighted, as well as negotiations were held with potential partners and presentations of new projects were presented.